Designed by Ronan and Erwan Bouroullec, the Alcove Plume Contract sofa has a reductive design that appears almost like a minimalist sculpture. Filled with PU foam and PE fleece. Its cubic shape serves as an architectural element that can be used to structure interior spaces. 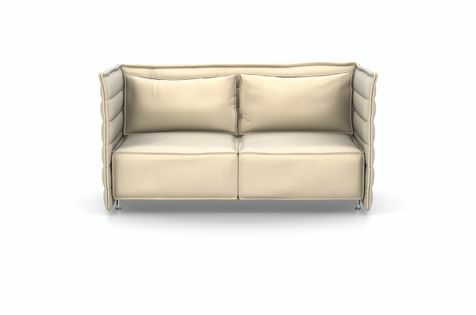 In contrast to its emphatically linear contours, Alcove Plume Contract offers the soft comfort of a lounge sofa and brings sheltered seclusion to offices and public spaces. Integrated MDF panels for structural support; panel elements connected by zip fasteners. Multilayer PU foam upholstery with Bonnell spring core. The seat cushions can be individually detached and the fabric seat covers are removable. Seat height 410 mm (measured according to EN 1335-1 = 310 mm). Powder-coated steel, no external tubularÂ frame.